Handmade Jane: Finished raincoat….at last! Well, it's been a long time coming but I'm pleased to announce that my vintage raincoat is now finished. THANK GOD! This coat has been a true test of my powers of perseverance and let me tell you, they were well and truly tested. I started thinking about making a raincoat back in October in this post, and was lucky enough to find a pattern that was exactly what I was looking for (vintage Simplicity 5928). On this occasion it was Amy of Sylkotwist who came to my rescue, very generously gifting me the pattern. Thanks Amy, you're a doll! The pattern is from 1973 and although the instructions are clear, there is a presumption that the user has a good deal of dressmaking knowledge and experience (which was probably standard in those days to be fair). They're also pretty sparse, so it's lucky I decided to embark on this project a few years into my sewing life - if I'd tried to decipher them as a newbie I'd have given up within the hour. I don't want to bore you to death with a catalogue of disasters but there were two bits of the coat construction that just didn't work. The coat originally came with two piece sleeves which gave it a lovely elegant, tailored look. Sadly, they weren't to be - despite six (six!!) tries, and me mercilessly slicing off quite a bit of ease, I just couldn't get the sleeves to fit in the armholes. I still can't work out why this was, but I'm not going to dwell on it. I ended up ordering extra fabric and drafting one piece sleeves. They set in like a dream and although they don't have the tailored look of the original sleeves, they're absolutely fine. The other part of the construction that I had to totally improvise was the lining. The lining itself sewed together perfectly, there just wasn't enough ease in it when it was joined to the coat. In fact the bottom of the coat looked just like a puffball skirt, which wasn't really the look I was going for. This seems to work fine and it actually makes the coat a bit less restrictive to wear. 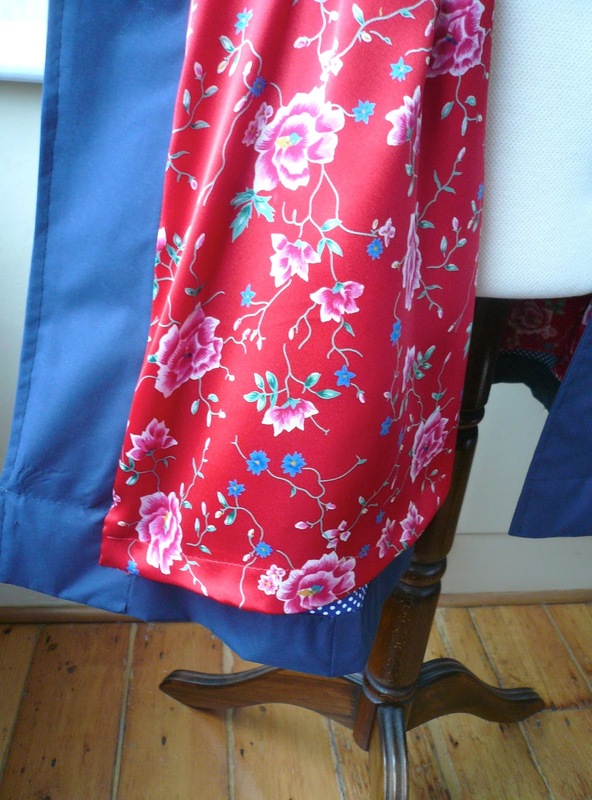 I covered the raw edge of the coat hem with bias binding as this would ordinarily have been concealed inside the lining. Right, that's my whingeing over, let's be positive folks, everything else about this coat is PERFECT. It's exactly what I wanted in a raincoat and I love the look of it, I think it's very me! There are lots of details about the pattern that I really love: the collar shape, the princess seams, the slight flared, flouncy bits around the bottom of the coat and the concealed seam pockets. The pockets are positioned just a bit too far down for my stumpy arms (ahem), but I can reach them which is the main thing! I can just reach those pesky pockets! I used a waterproof coated micro fibre fabric which I haven't had the chance to test in any real rain yet, but this is the UK, so I won't have to wait long. The lining is a gorgeous red floral fabric that I found stuffed at the bottom of a box on a stall on Portobello market. There wasn't enough to cut sleeve pieces from it so the sleeves are cut from a plain red lining fabric which turned out really well. I like knowing that beneath my functional navy raincoat, I can thrill passers by with a subtle flash of red floral fabulousness! And here's another one with an even madder face…. I utilised Scruffy Badger's excellent tips for working with this fabric (you don't need a teflon needle to work with this fabric, use weights when cutting it out and use a longer stitch length). The only tip I blatantly disregarded was the one about pins. Her advice was to use hair grips to hold seams together and not to use pins. Well, I heeded this advice for about five seconds and then lost the will to live - soz Winnie! I discovered that pins don't leave a mark on the fabric, even unpicking actual stitching from six sleeve attempts didn't cause a problem. Yes, there were stitch marks on the inside of the fabric, but absolutely nothing was visible on the right side of the coat and any rogue unpicking marks are all hidden by the lining anyway. Once I'd finished the coat I sent it to the dry cleaners for a professional press, which gave all the seams and hems a nice, crisp look. A-MAZ-ING! Wow. Well done Jane, this is spectacular! Great-looking coat! I always let my linings hang free on long coats, btw. It just looks better. The coat turned out beautiful and love the lining! love it. and every cloud has a silver lining - i love the polkadot bias on the hem. it's very you! quick run outside now - it's tipping down here! This is so perfect for you Jane! I love the shape and the combination of the blue, that red lining and the polka dot binding is just scrummy! Well done Jane. Beautiful coat. I love the lining too. It looks great on you,. I have had problems with sleeves occasionally too. Your solution was a good one, although it cost you for extra fabric. Once you're committed, it's all you can do. Ah-mazing! 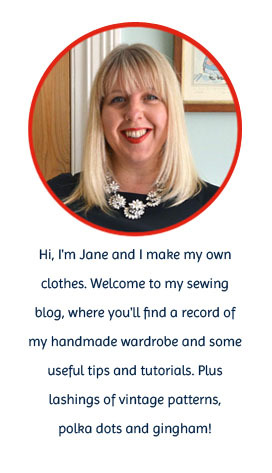 You're right to be thrilled with this Jane, and it rewards your perseverance with the sleeves! I especially like the flash of floral lining - so fun and flirty and you! Beautiful raincoat, Jane! I love the lining fabric. Sorry to hear you had trouble with the sleeves but your self drafted ones look like they came with the pattern. Great job, you'll be dancing in the rain with pride I'm sure. Really inspiring. What a gorgeous coat, Jane! Beautifully done! Every time it rains, I kick myself for not having a proper rain coat! This is fantastic! I'm sure it will become one of your most used and beloved me-made garments! Lovely coat! I like the pretty lining and classic lines. May I make a suggestion for the future from one short lady to another? I know the temptation is to shorten the coat (or dress or blouse) from the bottom when it is done. I have found it is more useful to do some of the shortening at or near mid body instead. This helps preserve the proportions better and prevents things like barely being able to reach pockets. Well, I do worry excessively about arm related issues. Mine are short, even for a short person. I need to roll up sleeves on RTW items from the Petites Dept! It looks incredible, inside and outside! I totally love it! The collar is quite lovely without looking too young. Overall, such an awesome raincoat! This is crazy cute!!!!! I love it on you! The lining and polka dot binding make this even more adorable! Well done, Jane! The coat is terrific and looks really great on you. My gran had a raincoat just like that in the 50s. Well done. I'm sure hers didn't have that fabulous lining. Perfect! Love the lining, and a great tip getting the dry cleaners to press it. It's absolutely gorgeous! I love the flash of red on the inside, and how blue and red your whole outfit is. Well done for persevering! Gorgeous, what a PERFECT staple raincoat! Kudos to you. That lining is adorable too, what a fun pop on the inside. You'll get tons of wear out of it! It’s totally fabulous, Jane. The coat looks fantastic on you, and that lining is amazing. I'm a big fan of hidden fun in my garments... they make me feel like I carry special secrets, like a spy or something. I have to say that I admire your perseverance with this make. In my experience, when things start to go south I abandon them in the UFO limbo so I'm totally impressed that you stuck with this - and how worth it because I bet you've gained new skills to your repertoire, plus now you have the perfect raincoat. Fabulous all around. Yet another fabulous make. Well done. It looks gorgeous on you. Jane it's lovely! You're really good at knowing your style and making things which are perfectly 'you' - a harder skill than it sometimes seems! This is fabulous! I LOVE the lining (and also your red tights!). I truly admire your perseverance with the sleeves. Happy wearing! Wow, beautiful coat Jane, I've been waiting to see it and then as usual I arrive late at the comments! Glad the weather is perfect for you, you'll get plenty of wear!